Ukhimath is to Kedarnath what Joshimath is to Badri. Both these towns, founded by the Hindu seer Shankaracharya, serve the same purpose. When Kedar and Badri hibernate under the winter snows, the deities are worshipped at Ukhimath and Joshimath respectively. 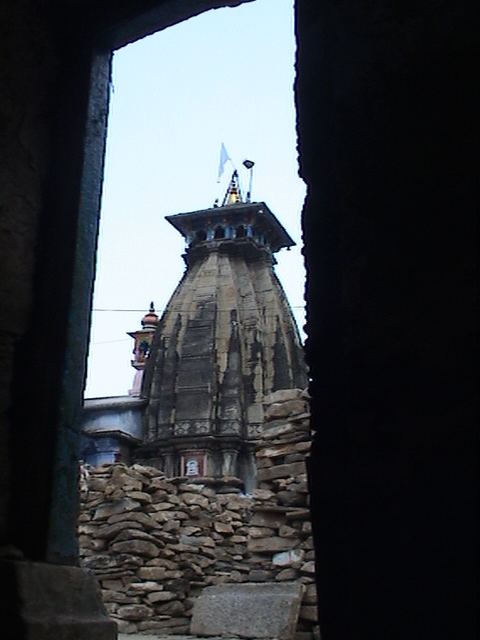 Ukhimath is the local name for Ushamath. Legend has it that Usha, the daughter of King Bana- a political adversary of Krishna- fell in love with Krishna’s son, Aniruddha. This led to war between the king and Krishna, apparently near the town of Shonitpur in this region which was the capital city of King Bana. Local people can still point out the remnants of a fortress attributed to the legendary monarch. Ukhimath is where the head priests of Kedarnath- the Rawals- live and work. I used to know a previous Rawal here extremely well, and had spent many days at Ukhimath on my various trips to this region. In fact, he was the one who took me to Madhmaheshwar for the first time. Another time I trekked to Deoria-tal from here. 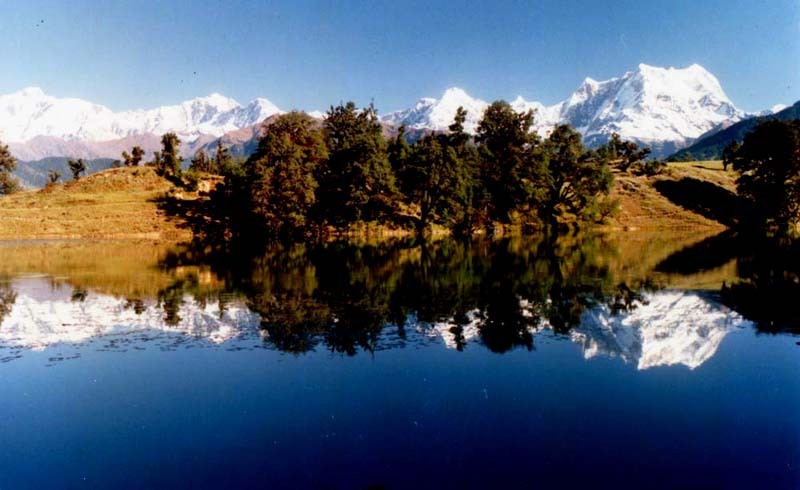 This beautiful lake lies atop a mountain North-East of Ukhimath, a leisurely day’s walk away. To get there, you proceed a little way along the road to Tunganath, and then leave it to climb the mountain on your left. You need a guide to navigate up this thin track through some dense forests. The priest had got one of his own men to accompany me. It is difficult to gauge the distance. Some say it is a mere 5 km from Ukhimath, others contend that its 10 km. It is a steady climb through the forest, with occasional stretches of level ground. Its very peaceful here. After a while, suddenly you hear the animated chatter of countless birds, and soon after you walk around a bend and the forest ends. In front lies the massive lake, at a height of 8,000 feet. I’m told the lake is about a kilometre in length and half a km across. In the distance you see the peaks of the Chaukhamba, Kedarnath and Badrinath (Neelkanth). The reflection of the peaks sways gently on the surface of the lake, as if the king of the mountains is admiring his own image. A hermit used to live by the banks of this lake in his little hut. A Bengali, he used to meditate here in peace, living on water-chestnuts. I never got to meet him as he had passed away a few years before I went there. I saw his deserted hut in ruins. There’s a lovely description of this man in the book Letter from the Himalayas by Ghantakarna. I spent so many peaceful nights at Ukhimath. But once, I remember being woken up in the middle of the night by a strong quake. Everything was shaking. I could hear a distant ominous rumble, as if the mountain itself was moving. In the dark room I could feel my bed shaking. The wooden furniture started vibrating, the window was shaking. The tin roof over my head was rattling and I could hear the nasty, grinding sound of large rocks rolling down the slope somewhere close. This was my first brush with an earthquake in the Himalayas. I remember I refused to move to safety. In the plains, during an earthquake you leave the building to gain the relative security of open ground. There’s no such security in the mountains where the ground itself might shift from under your feet. Then there’s the fear of avalanches. I lay there and gave myself over to fate. There were other, smaller tremors during the night. Periodically I would hear the rattling tin roof mixed with that strange rumble from the bowels of the mountain. The next morning everyone was talking about it. Fortunately, the town’s buildings had escaped with minor losses. Over the next few days, the mild tremors persisted.